Major retailer ERM becomes first to choose paying penalty price over investing in new wind and solar, taking advantage of extensive tax losses. In a worrying sign, a major electricity retailer, ERM Power, representing 10% of the market, has opted to pay $123 million in penalties rather than choose to build or contract new wind and solar and surrender 1.9 million large scale certificates to comply with the Renewable Energy Target. ERM is one of the country’s biggest electricity retailers, and specialises in the business market. Its decision to pay the penalty price is based around its own financial position, and its extensive stock of tax losses, and is the first time a major retailer has chosen penalties over supporting new wind or solar. The decision brought an instant rebuke from the Clean Energy Regulator, which promised to take action: “We view the intentional failure to surrender certificates as a failure to comply with the spirit of the law and an undermining of the objectives of the scheme,” it said. He also suggested that the penalties paid by ERM should be committed to support for the Australian Renewable Energy agency. “Restoring ARENA funding would mean these funds would still be used to directly fund renewable energy solutions,” he said. Tristan Edis, lead analyst with Green Energy Markets, says compliance with the RET (there are increasing targets each year culminating in total 33,000GWh by 2020) has historically been tracking above 99%. This figure was backed up by the CER. However, he warns that penalties – an effective capital strike against renewables – will become increasingly prevalent as a result of the stall in investment in large scale over 2013 to 2015 under former Prime Minister Tony Abbott, when the Coalition pushed to scrap the target altogether. That push is still being made by the Coalition’s far right faction. “Unfortunately, the Abbott period destroyed investor confidence in renewable energy and supply has not kept up with the target,” Edis says. According to an analysis by Green Energy Markets, there are sufficient LGCs to meet the targets for 2016 and 2017, but they fall short of requirements in 2018. However, GEM notes that other quirks in the market mean ERM and many other retailers will opt to pay penalties before this time. Power retailers are penalised $65 for every MWh or LGC they fall short of their share of the RET. However, the market has been prepared to pay substantially more for LGCs than this because penalties aren’t a deductible expense for tax purposes. Spot prices for LGCs have recently been changing hands for around $88. Edis notes that given the 30% tax rate a retailer in a tax paying position would be better off buying a tax deductible LGC for as much as $92 rather than paying the $65 penalty. But it turns out ERM and some other retailers aren’t in a tax paying position. After reviewing financial returns, Green Energy Markets found ERM had significant accumulated tax losses. In a statement announcing its intention to pay the LGC shortfall, ERM noted the differential between the non-tax deductible shortfall cost of $65/LGC and a market price of over $90/LGC. “By electing to pay the shortfall charge of $65 per certificate in place of surrendering 1.9 million LGCs, ERM Power has adopted an approach which accelerates the utilisation of tax losses and preserves the right to purchase and surrender certificates for 2016 within the prescribed three – year window,” it wrote. The decision has potentially significant implications for ERM customers, who will now be paying money to the government rather than renewable energy. For many, this could have reputational issues and could lead some to consider investing in their own renewable power, as even large energy users such as Sun Metals are doing. Edis notes that many of the leading retailers, including giants Energy Australia and Origin Energy, are likely to find themselves in a similar position. major step backwards they should have their licence to supply revoked. I’ll be staying with them until someone can beat their price. Never come across a retailer with such good service and such a good management panel. They still paid what they needed to, you seem to have a problem with the RET policy rather than ERM..
We use around 15,000 kWh per month on multiple properties and ERM seems to win on price. We don’t have solar so FIT doesn’t matter, neither does service fee as we use so much. Stewart who do you work for or what does your business do . Civil disobediene would be justified with someone working out how ERM’s customers can be informed and encouraged to change their supplier. It would not be a surprise to see EA do the same – as they probably have accumulated tax losses. They did this with Energy Efficiency certificates a while back. A real shame given that the cost to get a Wind farm up is $70/MWh – a discount on all states 2018 futures prices – which means if the market were effective the price for RECs should be zero. “AEMO et al is working for who?” is the question. No i don’t think.it is. How about 40% owned by it’s member organisations — some of them the same one gaming the bid/settle market in SA. The real problem: “’Unfortunately, the Abbott period destroyed investor confidence in renewable energy and supply has not kept up with the target,’ Edis says.” Until the government is clear in their signals to the market, the response will be weak. Australia has ample renewable resources if the signal is clear. If ERM’s customers bolt or pressure them, it would send a signal to their competitors that the consequences are much worse than the direct cost of the penalty. Focus on major customers of ERM to change the tone of the market for the next few years. This may light a fire under investment in renewables. If the public can bring pressure to bear on major customers of ERM, large solar farms can pop up faster than any other source of electric generation. The cost of solar PV has fallen dramatically in recent years, so solar is a very feasible alternative. The government controls the ease or difficulty of permitting, so the focus comes back around to government, too. Can the penalty price be set arbitrarily to be a Real disincentive ? Need a major campaign against ERM. Switch on Solar and Wind – Switch off ERM!!! We also need to jam there call centres with phone calls letting them know we think what they are doing is despicable. I’ll be staying with them until someone can beat their price. Never come across a retailer with such good service and such a good management panel. They still paid what they needed to, you seem to have a problem with the RET policy rather than ERM. You haven’t tried Powershop then. It has an awesome customer management panel. The best going. As for the policy – it’s an internal policy position of ERM to pay the penalty rather than develop renewable energy or contract the certificates given its relatively line ball. They are deliberately doing this as a political act and it will be followed up by barking by Liberal party /Govt people wanting to cancel the RET scheme. All too obvious and predictable. I have tried comparing with PowerShop. They can’t beat the price I pay for 15,000 kWh per month in my area. Of course its an internal position but the RET allows companies to pay the penalty price if they don’t have the correct amount of LGCs to surrender. Like ERM I also choose the lowest cost option for complementary basic goods like energy. What are ERM charging you? Rates, numbers. You probably ought to generate yourself using solar. It is probably lower cost than ERM. We found that the transmission costs added around $25/MWh to our electrical import and then we added gas on top of that. We ended up installing gas fired cogen, saved a packet, increased our efficiency and reduced our emissions at the same time. We,re in the process of rolling out predictive analytics and other efficiency measures to push the envelope further and effectively reduce our electrical imports to zero (we’re currently pushing 82% LHV at times and want to get higher). Is RE part of that mix? Only if it makes economic sense. It would be there if we had more sunshine. Mining companies in sunny areas should already be at a point where it is economic to consider RE and may well have spare holes to consider pumped hydro or large flow batteries. A big development would be for manufacturers of piston generators to get on board and adopt brushless doubly fed generators in their product line, effectively allowing turndown to 25% load. ” and reduced our emissions at the same time.” Big assumption. Howarth et al demonstrated that if fugitive emissions are greater than 2.5% then it’s can be as bad as burning coal to make electricity — or worse. Direct detection in the atmosphere using aerials, flight and vehicle based detectors over gas fields in the US by NOAA and Ivy League universities have shown loses are at least as bad as 2.5% FE. LNG can be worse than supercritical black coal power plant too. Barrow island still venting masses of CO2/CO/methane even though they were supposed to re-inject the CO2 into the subsea rock strata, never bothered, already losing way too much money. It’s not in the spirit of the RET and the only reason the REC market price is what it is (and so much above the penalty price) is because Tony Abbott and his mates white-anted the RET and brought on the four or five year drought on wind developments in this country. The issue here is that you take off one black hat and put on another. Viable and cost effective storage needs to become mainstream before some of these larger players become really serious on renewables. A lot of industrial customers can’t afford to have variable supply in electricity and gas and don’t have the luxury of co-generation installations. In many cases it takes hours to shut down and hours (or days) to start back up again. Unfortunately the renewable landscape as it stands is just not delivering what industry wants. Business/industry will only tolerate so much before they start to react. That point has been surpassed in SA and will fast come to a head in Victoria. We need investment in both generation and storage that is both cost effective and reliable, not periodic and hypothetical with prices that look good on paper, yet leave the gate open for rorting by the incumbents when supply drops off. That is exactly what this article is telling us, not what the author wants us to believe. Rubbish, two states in Germany’s industrialised north are >100% RE already. They export energy to Denmark and elsewhere even paying for offtake at times. Penetrations of well over 50% RE are required before storage is an issue. Sustainable Energy Now has modelled going to 85% RE on WA’s SWIS grid without any need for storage and demand and generation balance against ten years of historical wind and insolation data from NASA (the SAM dataset). Gas does the power balancing in those scenarios at and below 85% RE. Taking on the last 15% of RE to get to 100% RE means storage, high tech options like falling water (Pumped Hydro energy Storage already in use in Australia for decades), generating and storing process heat (Molten salts in conjunction with Solar Thermal power plants CSP/CST) and chemical batteries, the explosion of which we haven’t really even seen occur yet but so many chemistries are in the lab i can’t list them all and many close to commercialisation point already (metal air, flow, graphene supercapacitors which will first enter small uses due to superior energy density and material cost over lith-ion but eventually could be doing EVs and stationary power and made by the robots depositing atomic thin layers of graphene on top of each other). 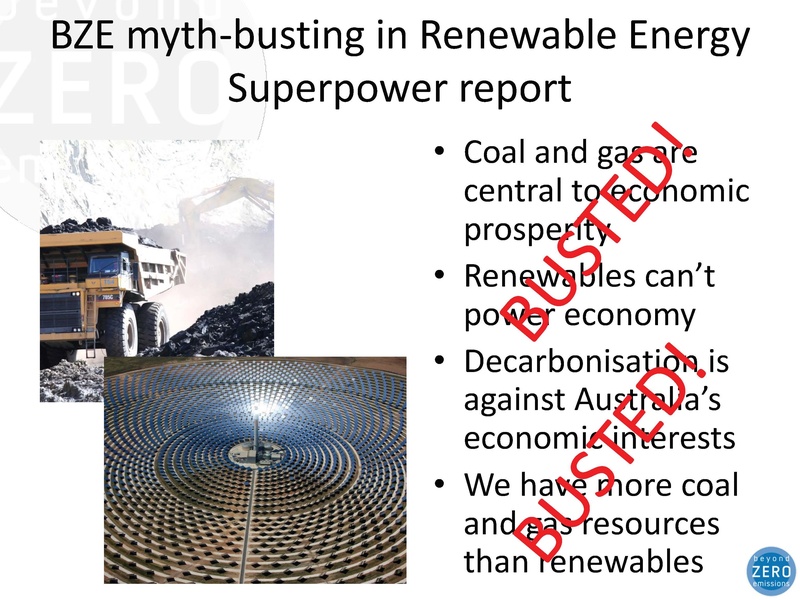 Suggest you give the Exec Summary of the BZE Renewable Energy Superpower report a read, Ian. Substantively refutes every single point your claiming. A few points to add to the discussion. 1) ERM is a very well managed company. They have taken a big slice of the C&I market by giving customers what they wanted – low prices and accurate bills. This decision was obviously considered at the highest levels to be in the best interests of ERM shareholders. 2) The damage to ERM’s reputation from a decision such as this seems small. Origin is on the front page of the business papers because of the whistleblower case. That story has a whiff of scandal about it. This is about accounting and is completely legal – not very interesting to most people. 3) Note that ERM just rolled their funding over to ANZ – it’s not huge, a loan of about $250m to support their operations. Saving $40m to $50m in cash by paying penalty instead of purchasing LGCs makes sense and absolutely would have been a big point of discussion in the funding arrangements with ANZ. My guess – they won’t lose a single customer over this. Businesses are amoral and their entire customer base is made up of business consumers. ERM aren’t the first and they won’t be the last to make this choice. Unfortunately I think you’re right on all points. Quite true perhaps, but business customers make up two-thirds of all stationary energy consumption. If all of these customers and private households decided at once to be more ethical, we could see a demand that would impact on 33% of all Australian emissions. Not an inconsequential figure really. Thanks Chris. I agree with the sentiment, but that’s probably a bit optimistic. * Big Berthas – think smelters and other industries where energy is a critical input cost. They compete internationally and are generally under huge pressure to reduce costs to either increase margins (e.g. mining) or stay alive (e.g. aluminium smelting). * Large C&I – government departments, telcos, data centres, smaller manufacturers etc. The spend 10’s of millions on energy every year. If it is rationale (i.e. aligned with the interests of their stakeholders) then they *might* adopt clean energy. Because of the size of the spend, their procurement processes make it very difficult to take anything other than the cheapest energy. * Small C&I/SME – banks, commercial property, restaurant chains etc. They sending hundreds of thousands or a few million on energy every year. Not a significant part of their business costs. Usually managed through a consultant, because they don’t have the expertise in-house. Because it’s non-core and they are risk-averse, they will rarely even consider clean energy. Only reason to do so is brand-benefits, giving them something to put into their sustainability report. I would love it if business did perceive greater value in shifting to a clean energy strategy. If they did, then retailers such as ERM would certainly be a leader in that space. Don’t worry it won’t be long before renewable with storage is significantly cheaper than all fossil, it’s already within striking distance. And the rate of cost plummet shows no sign of slowing. Lazards in the US puts it at 5 years. Ethics and morals won’t apply, it will just be cheaper and better. I use ERM Power because they are experienced and cost effective. What people need to realise is that they still pay the penalty and the CEC can still use this money on renewables. It’s just the choice between two options. “Large accumulated tax losses” == the company’s been losing money continuously. Experienced and cost effective? More like Crazy Eddie. Seems like a high likelihood of bankruptcy in that position. Reputation is important in business. More important than it seems at first sight. ERM has had a series of downgrades in recent years and this does negatively impact the company’s cash flow although shareholders may recover most of that from dividend franking. Last year one explanation for an earnings downgrade was changes in SREC pricing. To me this shows: (i) yet another deficiency in the current RET scheme. (ii) Certificates really are tight (iii) ERM really isn’t doing its bit. Its the 4th largest retailer in Australia by volume but hasn’t signed a single PPA with a renewable developer. To say its customers contract short and it would have to contract renewables long is disingenuous. It certainly plans to be selling lots of volume in Australia over the next 10-15 years even if not necessarily to the same customers. The bottom line is that the sooner we move from the RET to reverse auctions the sooner costs to consumers will fall and the sooner we will decarbonise. Thanks David – interesting to hear your (expert) perspective on how this could impact the broader reputation of ERM. The market clearly didn’t take the news very well – down about 15% since the announcement, when the rest of the sector looks to be up. You may very well be right. I’d put retailers in two categories – those that are looking for PPA’s and those that are not. There are a surprisingly large number in the second category. There are a bunch of factors (REC regulatory risk, “duck curve” fears) but the biggest one is that locking in large volumes of energy at historically high prices doesn’t look very attractive to them. During the drought we were all shocked when prices went through $50/MWh. We’re rapidly approaching $80/MWh now for Cal18 and all the headroom in retail prices is gone outside of VIC. They want to wait it out. I won’t comment on RET vs reverse auctions, as I’m conflicted. “Businesses are amoral and their entire customer base is made up of business consumers.” Okay, if you say so. This is not so much a case of amoral as immoral. Certainly it runs contrary to the spirit of the RET and should provoke increase in the fines and remedial action with ERM. You think we haven’t noticed? You think Powershop et al aren’t gaining customers because of said amorality buy the big energy retailers? In my country, there is no sun, no wind, only sadness so no one invests in renewables. This helps Putin’s companies make big cash in oil and gas. I am surprised however a company in the Sunshine State doesn’t get a couple of solar plants up and going. Simple solution may be to increase the penalty to $92, and make it tax deductible. This would remove the incentive for companies trying to take advantage of tax losses. It shouldn’t make any difference to company profitability, as they pass on costs to customers. It’s too bad so many companies put profit ahead of what’s morally right, no?